In 1993, a man who could have created a theme park dedicated to himself, Steven Spielberg, decided to adapt a Michael Crichton novel into a film, and create a different kind of park. At the time I was 11 years old, and was a member of the generation that was able to experience this for the first time with innocence behind my eyes. Jurassic Park was the first film to ever bring magic from the screen into my life, and ultimate made me fall madly in love with movies. Like Chris Pratt said in an interview recently, it was the first true movie event of my life. I saw it 4 times in the theater, and Jurassic Park is and always will be somewhere in my top ten favorite movies of all time. I watched the original Jurassic Park, the day before I went to see Jurassic World, and found the same magic still existed today as it did in 1993. So many films fail to age gracefully, but that list does not include Jurassic Park. It is still the same juggernaut today as it was back then, and still gave me the same moments of intensity, the same scenes of laughter and levity, and the same moments of sheer terror. It is pure movie magic, in every way. I dare anyone to say the theme song doesn’t still resonate with them, or the T-Rex moment, or the Raptor moments, or, I think you get the picture. Jurassic Park is moment after moment of cinema history, which took filmmaking to levels never reached before. Since 1993, I have grown up quite a bit (at least I like to think so), and have always dreamed of a new dinosaur film that forced us to ignore Jurassic Park: The Lost World and Jurassic Park 3. They fail to even be mentioned in the same sentence as the original, so my hopes were high that after all this time, Jurassic World would pick up right where the original left off. At the end of Jurassic Park, it was made very clear how terrible of an idea it was, so clearly, we just needed to wait to forget why, so we could make a new park! Jurassic World, in the most articulate way possible, was awesome. It was thrilling, it was adventurous, and it had something Jurassic Park didn’t have, and that is a true headlining movie star. Chris Pratt is a man the guys want to hang out with, and the man the ladies swoon over. After just three films, Guardians of the Galaxy, The Lego Movie, and Jurassic World, Chris Pratt is a superstar, and well deserved. With that being said, he is the magic in this movie. His presence on screen demands your attention as much as the dinosaurs, and since the film is nearly all Pratt and dinosaurs, my attention was locked on to the film. Colin Trevorrow takes the helm for Steven Spielberg, coming off of his 2012 film, Safety Not Guaranteed, which was a fantastic little film I deeply enjoyed. With a partial screenwriting credit, he does a fantastic job directing the film trying to fill the shoes of arguably the greatest director of all the times. No one expected this to be as good as the original, and I believe he accepted that, and set out to make the most enjoyable, entertaining film he could, and succeeded. There are tons of moments he included, like Mr. DNA, the T-Rex glasses, the original Jurassic Park Jeeps, which were little homages to the original. Moments like this really did make a positive difference in the overall film. Speaking of homages to the original, going into this film I expected characters from Jurassic Park to be grown up and littered throughout this film. I was very surprised to find that wasn’t the case. I’ve heard rumors Chris Pratt’s character was the chubby boy from the dig site with Dr. Grant, who thought raptors weren’t scary, or he was going to be Tim Murphy all grown up. None of these were true, which surprised me. Maybe it was too easy, or they wanted to separate themselves, so they wanted to avoid direct characters from the original. I really expected Bryce Dallas Howards character to be the grown up Lex Murphy, but none of this was the case. 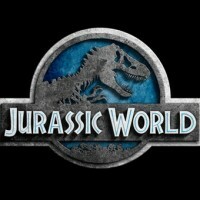 In all honesty, I was a little let down Jurassic World never had that moment of revelation, it could have helped add the splash of magic from the original this film was lacking. The creation of the park and the details of the island are almost more interesting than the dinosaurs themselves. There “Bracelet Scanners” are very reminiscent of the Disney Magic Bands, and are added bits of detail that really shine with realism. Especially the brochure for the park, which at quick glance, I laughed knowing Jurassic World was sponsored by Coca-Cola, Samsung, and Starbucks. I wonder if they are still going to be sponsors by the end. Whether it’s the Gentle Giants Petting Zoo, the T-Rex Kindgom (which was a lovely throwback thanks to the goat), the Creation Lab, or the Aviary, a ton of attention to detail was put into the creation of the park. In the Jurassic World brochure, it states, “PLEASE do not tap on the glass, cross barriers, throw anything into the exhibits, make excessive noise, tease or call out to the animals”. But, the two boys find an attraction that allows anyone, even those without a driver’s license, to drive around incredibly expensive bubbles of glass. Very reinforced glass as the special recording states, unsupervised, to dodge dinosaurs that could sit down at the right moment and put an end to any vacation. I’m starting to wonder if their parents sent them to the island, so they wouldn’t come back. Almost as enjoyable as the park details, was Mister Jake Johnston. He wears the vintage Jurassic Park shirt, as I also wore my shirt to the movie, but is the person in the film who reflects the audience. With his insider knowledge of exactly how a person would act in a disaster film, he makes fun of the genre film while it’s unfolding around him. When he vows to stay behind, to be the sacrifice, or when he tries to kiss the girl, and gets rejected after having misread all the signs, as the audience we can’t help but smile. It was the best laugh in the film, a moment of levity in the peak moments of fear and carnage. This is especially known when his poor dinosaur collection gets knocked over, and was nearly the most emotional moment of Jurassic World. The addition of incorporating the aspect of the crowd was excellent. The theme park itself is on an island, it is inescapable, and that in itself creates a feeling of claustrophobia and fear. These thousands and thousands of people are trapped in a park, filled with strangers being killed around you and destruction at every turn. It’s scary to imagine. Watching the crowds flee, pushing each other aside and tripping over one another, while the Pteranodon’s pick them off one by one, was both intensely fearful and highly enjoyable. There are a ton of plot points and aspect of this film that really were unnecessary, or just flat out unbelievable. The two kids constantly discuss their parent’s separation, which is never followed up on. Irrfan Khan’s character, Simonh Masrani, and his piloting skills, lead to the most unimportant death, especially for a character we were starting to latch onto and root for. Was this there attempted to redo the death of Samuel L. Jackson? At least his death led to a moment of horror finding his arms not attached to his body. Irrfan Khan is apparently an important character, or at least I felt I was led to believe, whose only purpose is to crash and burn to release the Pteranodons. I can’t continue this review without discussing the dinosaurs. 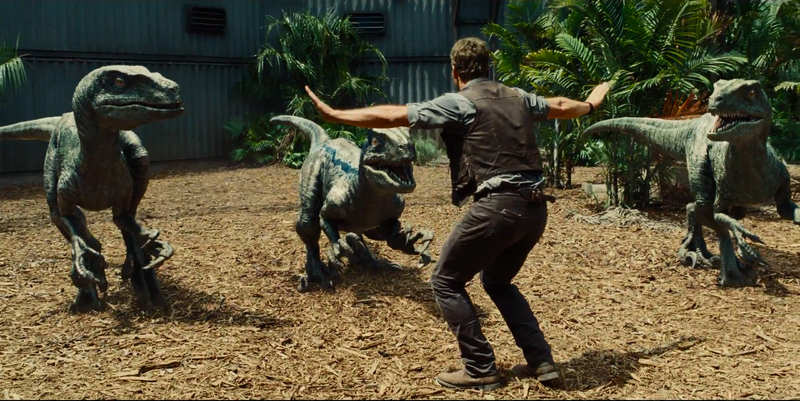 Even though Chris Pratt is the magic behind this film, it wouldn’t even be a film without the dinosaurs. In the original, the Raptors were relatively unknown, and were kept hidden as a spectacle. Jurassic Park while having a ton of dinosaurs, found its focus with the Velociraptors and T-Rex. After twenty two years since the original opening of Jurassic Park, Jurassic World gives us something new, the dinosaur man tampered with, so it can turn and destroy its creator. Indominus Rex, the dinosaur for our ADD generation, is certainly one big bad dinosaur. Society becomes so bored with the ordinary, that even ordinary prehistoric creatures like T-Rex aren’t enough. A hybrid, is needed to fill the current generation with the excitement it needs. It outsmarts, it hunts, and it even turns our own trained killers against us. It kills for sport, it camouflages itself, and it has everything the screenwriters needed to help it destroy everything in its path. It’s so scary, that it can’t catch two little kids running for their lives, but who’s counting. Every moment Indominus Rex had on screen, was a nail-biting moment to remember. Good thing for us, the battles in this film are aplenty. Indominus Rex versus the T-Rex, which we are left waiting for so long, I nearly forget about the big baddie. When he is finally revealed, it had enough effect to make myself and the audience I was with, clap and cheer out loud. There are moments in Jurassic World, like when the Indominus Rex is revealed to share DNA with another dinosaur, which defined this film. It took it from an ordinary action adventure, and gave it depth, even if it wasn’t very deep, it was still depth. As the dinosaurs all battled each other, the best battle was still Starlord versus Kingpin, which is never something I would dare complain about. In the end, the thought I’m left with, is when will they be able to do this in real life? Anyone who has the chance should make a trip out to Kualoa Ranch in Oahu, Hawaii where they filmed a majority of this film, as well as the original. I know, let me take the day off and go out to visit Hawaii. Still, if you ever find yourself on a Honeymoon, or washed up on the shores of Hawaii (none of us are so lucky), it’s well worth being able to stand in the valley of the stampeding dinosaurs of Jurassic Park. The success of Jurassic World is solely based on the popularity and success of the original Jurassic Park. By adding the most star worthy actor in the world currently, it was an equation for ultimate success. It reached a scale none of us could have predicted, but a worthy movie to reach this success none the less. We all knew it would make a ton of money, but never did I think it would make over 100 million dollars in its second weekend, the first film in history to do so. Regardless, this success means every year or so we will get a new Jurassic Park film, and that is the best news I’ve heard all day. Jurassic World was finally a follow up to the original that was worthy. While The Lost World and Jurassic Park III should carry a warning label that states “We’re not worthy!” Jurassic World deserves the success it’s receiving. It possessed just enough magic to make it a commendable sequel, and while it has faults, it has all the excitement, adventure, terror, and action to be one hell of a ride at the movies.